“Complications of permanent mesocolon suture”. An unusual consequence of retrocolic Roux En Y gastric bypass. Background: The debate regarding the retrocolic or antecolic routing of the Roux limb with respect to gastric bypass for morbid obesity has centered on the incidence of internal hernias. Retrocolic proponents claim that complete closure of all mesenteric defects limits this complication. There have been no reports of complications attributable to the mesenteric closure itself. Methods: Retrospective analysis of prospective database of 6071 patients who underwent laparoscopic Roux-en-Y gastric bypass in a private practice setting from January 1998 to September 2007 relating to complications of the mesenteric closure. 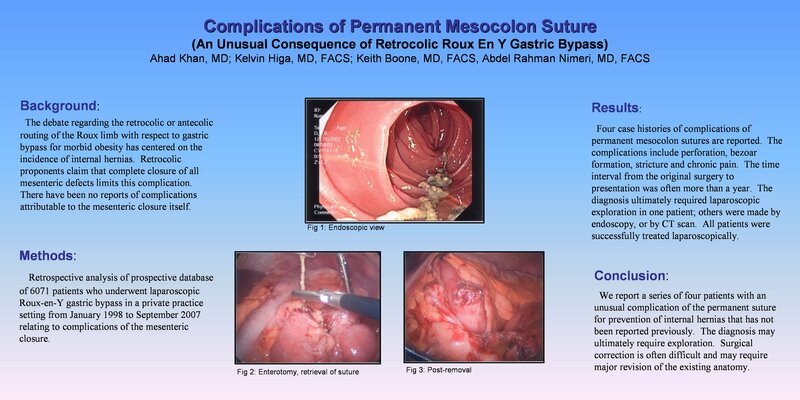 Results: Four case histories of complications of permanent mesocolon sutures are reported. The complications include perforation, bezoar formation, stricture and chronic pain. The time interval from the original surgery to presentation was often more than a year. The diagnosis ultimately required laparoscopic exploration in one patient; others were made by endoscopy, or by CT scan. All patients were successfully treated laparoscopically. Conclusion: We report a series of four patients with an unusual complication of the permanent suture for prevention of internal hernias that has not been reported previously. The diagnosis may ultimately require exploration. Surgical correction is often difficult and may require major revision of the existing anatomy.